Okay, we understand that making a fresh, wholesome plant-based dinner every night sounds like too much work, especially if your schedule is packed, you work long hours, you’ve got kids, etc. While we agree you could easily spend half a day in the kitchen cutting up fresh vegetables for the entire week if you wanted to, there are other options that aren’t such a drain on your time. 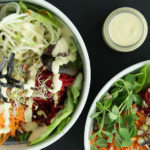 This 10 min Buddha Bowl is a perfect example of a fast yet healthy meal. Unpasteurized sauerkraut is an excellent source of digestive enzymes – it supports both the function of the pancreas and increases digestive strength. The fresh and bio active lactic acid which naturally occurs in raw sauerkrauts helps maintain a healthy acidity in the intestines creating an environment that is hostile to parasites but a good host for beneficial bacteria. Sauerkraut also contains high levels of dietary fiber, as well as significant levels of vitamin A, vitamin C, vitamin K, and various B vitamins. One serving gives you roughly 30% of the recommended daily amount of vitamin C. This is amazing, since vitamin C is the number one go-to antioxidant. It fights free radicals and boosts the immune system, among many other benefits. It’s basically a shield for our bodies from all the toxins we encounter on daily basis, preventing cell damage, and helping our skin to produce collagen. Vitamin K is essential for good bone and teeth health because it helps the body to regulate where the calcium goes. Vitamin K directs the calcium to go where it’s most needed. It can’t be emphasized enough how important vitamin K is. Besides its contribution to the health of bone tissue, it’s extremely beneficial against cancer, and it limits damage to brain cells which often leads to Alzheimer’s disease. Furthermore sauerkraut, it is a good source of iron, manganese, copper, sodium, magnesium, and calcium, in addition to contributing a moderate amount of protein to your diet. First, wash all the veggies (greens, carrot, beat, zucchini and sprouts). Chop the greens (in necessary) and divide them into two large bowl. Now run the zucchini through a spiralizer. Set it on top of the greens. Peel and shred the carrot and beat. 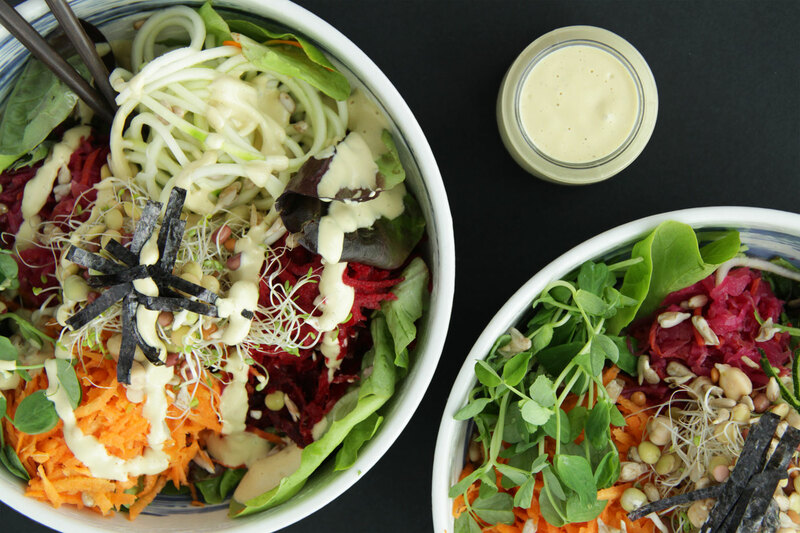 Add them to your salad bowls. Place all sauce ingredients in a high-powered blender and blend until smooth. Add more water, if needed to create the desired consistency. 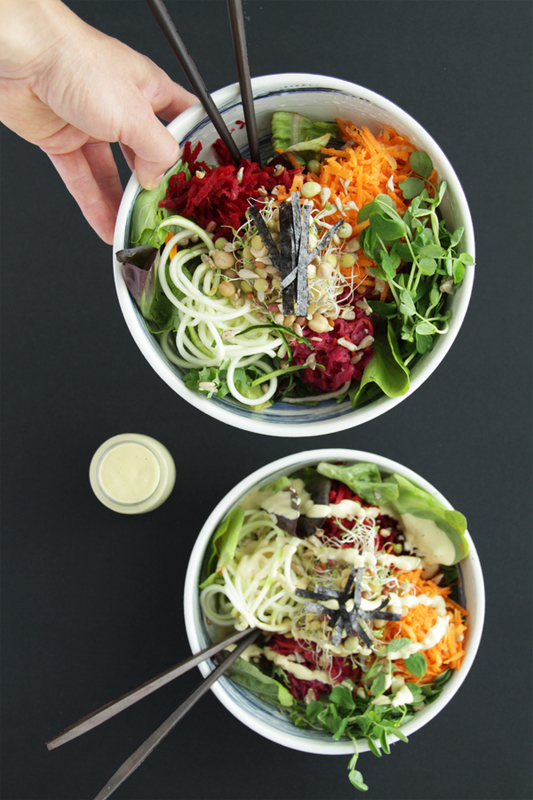 Top each salad bowl with 1/4 cup sauerkraut, 1/4 cup sunflower seeds, generous amount of fresh sprouts and finally chopped seaweed. Pour about 1/2 cup of cashew sauce over each bowl and you are ready to dig in. Enjoy! 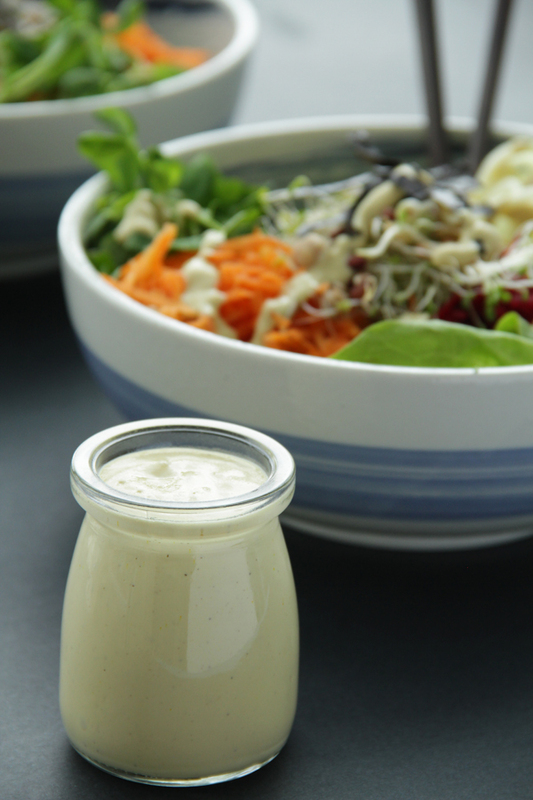 You can store any unused cashew sauce for 2-3 days in the refrigerator. If you want to eat healthier and lose weight you can do it even if you don’t have a lot of time to cook or prep food. The difference between the impossible and the possible lies in your own determination.